During the latter half of the 20th century, pizza in the United States became the divine dish of all Americans, and it still is today. Since the beginning of time, humans have cooked flatbreads on open fires, and then, bored with their lackluster flavor, added seasonings and toppings to make them more interesting. But the Italians claim that they created the first pizza, and who am I to argue with that, because look at all the other divine creations you’ll find in that country – the statue of David, the Sistine Chapel, and of course, The Pope. And you know that he must eat pizza, too. The question I want to ask the Pope, though is — does he eat cold pizza? Does he awake after a big night, and grab a slice from the fridge on the way to say mass at St. Peter’s Basilica? I’m certain he does. Although we don’t know exactly where the first pizza came from, we do know that Antica Pizzeria Port’Alba in Naples, Italy is widely regarded as the world’s first pizzeria. Peasants had been adding tomatoes to their flatbreads for many years, and that is what was sold in open air markets. But in Campania, Italy, in 1889, Raffaele Esposito created what we know as pizza today, in his restaurant Pizzeria di Pietro, for the arriving Italian king and queen, King Umberto I and Queen Margherita. The two varieties he invented were the Marinara and the Margherita, considered to be the pizzas of purists, and the ONLY ones that most Italians will eat. Marinara is made with tomatoes, oregano, garlic, and olive oil. Margherita is topped with mozzarella, basil and tomatoes, the colors of the Italian flag. 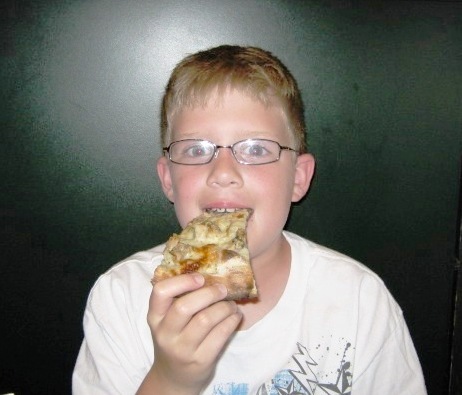 My nephew, Shane, eating his favorite White Clam Pizza from Frank Pepe’s in New Haven, Connecticut. We Americans, with our shameless and arrogant ways, added other toppings to pizza, and messed around with the original crust recipes. After all, why should we eat a pizza with tomatoes and cheese when we can have it our way, with sausage and peppers, mushrooms and pepperoni? Just for fun, I decided to ask members of my social network what kind of pizza they prefer, trying to get an idea of what is the most popular pizza in America. And out of a hundred responses, no two were the same. Do you know what that means?? Like a mathematician who is certain to prove his postulate, I was left dumbfounded to discover that when it comes to pizza, there is no certainty. It’s as if, since we are all created as individuals, we are genetically and inherently wired to like different pizzas. That means that we could actually be identified by our own pizzas, like our individual, one-of-a-kind fingerprints. For instance, people could identify me as a white pizza, thin crust, extra crispy, with artichoke hearts and garlic. I could recognize my friend Arturo by his pineapple, ham, and jalapeño pizza, and my friend Ginger, by her Thai-inspired pizza, sporting a tangy peanut sauce, green onions, chicken, and slivered carrots. And even as our differences in pizza will set us apart, we are all drawn together for the love of pizza. 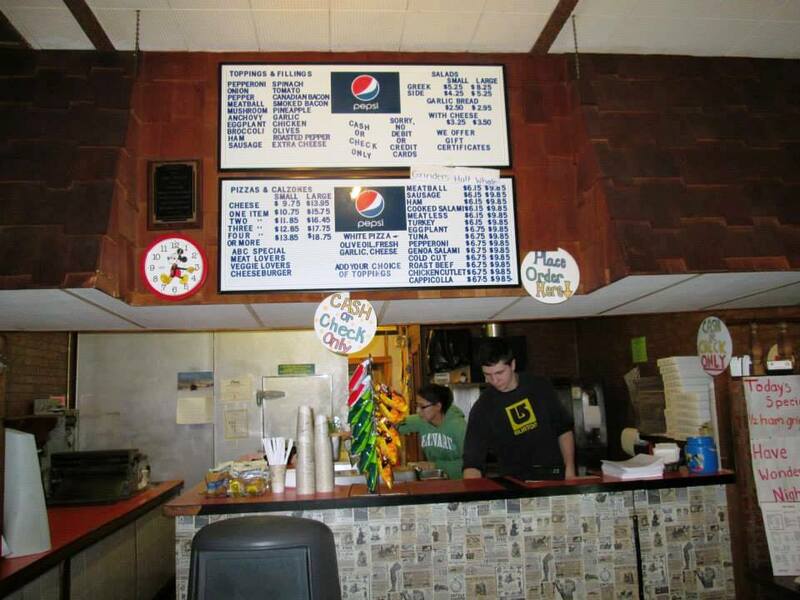 ABC Pizza in Granby, Connecticut, hasn’t changed at all since it opened in the 1970s. A favorite local hangout. There are many foods out there that all Americans enjoy – burgers, fries, mac and cheese, and spaghetti. But none that gets us through the good times and the tough times, like pizza does – late nights in the dorm, heartbreaking team defeats, the challenge of feeding a family of four on a tight budget. Pizza is always there for us, helping us define who we are. This story originally appeared in Jacksonville Magazine in 2014. Love, love, love your Podcast, Karen! Very clear, easy to listen to. You made me want to hear another! And I simply must make that Thai Chicken Pizza!